This project has been sponsored by LCSC.com. LCSC has over 700,000 customers and over 310 employees with around $150 Million in sales. LCSC distributes over 150,000 products ranging from semiconductors to resistors, capacitors, diodes, inductors, connectors, transistors, sensors, providing design-chain services with EasyEDA too. LCSC has DHL, FedEx, EMS, USPS and other logistics partners on site for the swift delivery of consignments to 200+ countries. The majority of people today possess smartphones. They have become an essential part of our life now. We need to charge them frequently to access our favorite social media apps and games. But what if your charger broke. Just joking! This project is for hobby and educational purpose. I will tell you that how can we make our own homemade smartphone charger with just a few simple components. Chargers are generally charging with 5V regulated DC supply. So basically, we are going to build a 5V regulated DC supply from a 220V AC. Not only for charging, but we can also use it for powering several digital circuits, microcontrollers, ICs, etc. The mains supply which comes to our house is usually 220V-240V. Firstly, we need to step-down the voltage to 12V using from 220V using a 12-0-12 step-down transformer. In transformer, there are primary and secondary coils which step up or step down the voltage according to the no of turn in the coils. Selection of proper transformer is very important. Current rating of a transformer depends upon the requirement of load circuit. Mind that the voltage rating should be more than the required voltage. Means if we need 5V DC, transformer should be at least of 7V, because voltage regulator IC 7805 drops about 2V for the voltage regulation. Rectification is the process of removing the negative part of the AC and only give positive part of AC. Thus, it produces the pulsating DC. 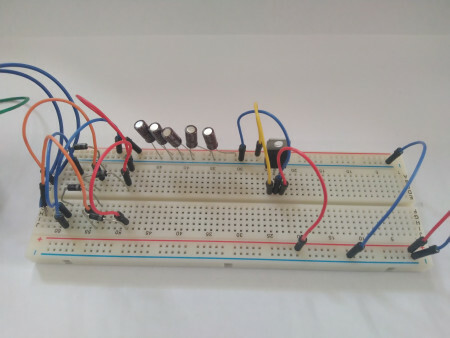 This can be achieved using 4 P-N junction diodes. Diodes are unidirectional i.e. they only allow current to flow in one direction. In first half cycle of AC, diode D2 & D3 are forward biased and D1 and D4 are reversed biased, and in the second half cycle (negative half) Diode D1 and D4 are forward biased and D2 and D3 are reversed biased. This Combination converts the negative half cycle into positive. 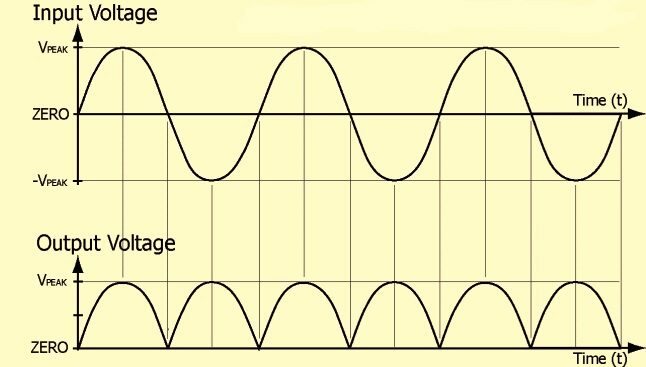 We will get a wave of 100Hz frequency after converting 50Hz AC into DC, through full wave bridge rectifier. 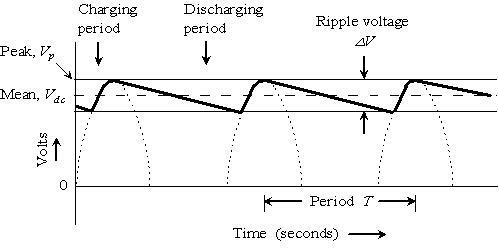 As the negative part of the pulse is converted into positive, one pulse will be counted two. Now 1.4v will be dropped on 2 diodes (0.7 per diode) as 2 will be forward biased for half wave. A voltage regulator IC 7805 is used to provide a regulated 5v DC. Input voltage should be 2V more than the rated output voltage for proper working of IC, means at least 7v is needed, although it can operate in input voltage range of 7-20V. Voltage regulators have all the circuitry inside it to provide a proper regulated DC. Capacitor of 0.01uF should be connected to the output of the 7805 to eliminate the noise, produced by transient changes in voltage.